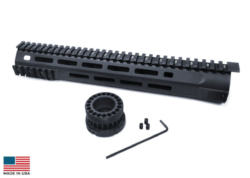 14″ REV™ II FREE FLOAT RAIL SYSTEM (M-LOK™) – BY FORTIS MFG. Fortis REV™ II is an extremely lightweight yet robust free floating rail system. When designing the REV™, Fortis didn’t want just another rail system, they wanted a better, lighter, feature rich handguard that was robust and within budget. Fortis managed to reduce as much weight as possible while maintaining strength by utilizing a 1 piece body design. MLOK™ cutouts were added at the 3, 6, & 9 o’clock positions for modularity and additional weight savings. Its unique mounting system captures a standard AR15 barrel nut for easy installation. Check out all the features and see for yourself why the Fortis REV™ beats the competition. It is also piston compatible. Has anti-rotation tabs. 12″ REV™ II FREE FLOAT RAIL SYSTEM (KEYMOD) – BY FORTIS MFG. 7″ REV™ FREE FLOAT RAIL SYSTEM (KEYMOD) – BY FORTIS MFG.